An economical way to spot-check amount of vertical head wear for all rail sizes. Self-supporting magnet base grips underside of rail. Vertical floating scale reads rail height from 5 in. to 9 in. with 1/16 in. accuracy. 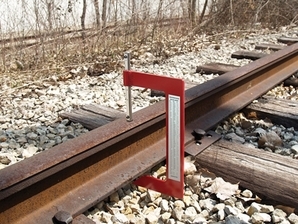 Chart on handle lists original rail heights for rail sizes 90-155 lbs. for comparison. Handle is made of steel plate. Elevation scale and rail chart are etched aluminum.